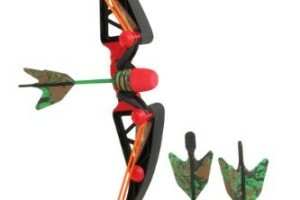 I was browsing through potential toys for review, I chanced upon this toy bow-and-arrow set and it instantly reminded me of The Hunger Games novels. Catering kids aged 8 to 15, the Air Hunterz Z-Curve Bow actually looks like a real-life hunting set without the sharp (and fatal) arrowheads. The Air Hunterz Z-Curve Bow is designed with safety in mind. Imported from China, this toy weapon can shoot projectiles at up to 125 feet with pinpoint accuracy. It provides hours of outdoor fun, especially for children who love the great outdoors. It comes with a pair of long-range foam and suction cup arrows, as well as a zip clip to hold them all together. Measuring 23.5 x 7.5 x 4 inches and weighing 1.2 pounds, the Air Hunterz Z-Curve Bow can be used by both left- and right-handed children, so no one is left out from the fun. Parents can even purchase arrow refills because two arrows are not enough. Even though it is a toy, this toy bow should not be aimed at the eyes or face, as well as at people (especially children) or animals. The Air Hunterz Z-Curve Bow is now available at Amazon with a listed price of $29.99.